A cute pair of sterling silver children's stud earrings, shaped into a classic heart with a pretty frosting of glitter. The perfect gift for any little girl. All of our children’s earrings are supplied with both metal and plastic scrolls for extra comfort. 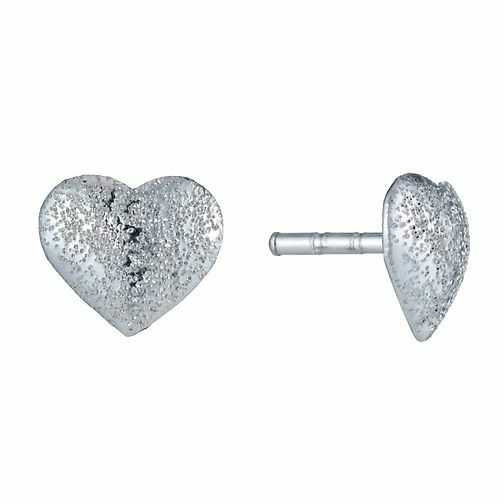 Children's Sterling Silver Frosted Heart Stud Earrings is rated 3.4 out of 5 by 5. Rated 5 out of 5 by Anonymous from Perfect for my 2 year old I love these earrings - they are really pretty and sparkly and just the right size for my 2 year old. The back fits tightly so doesn't slip off which means she hopefully won't be losing them. Rated 5 out of 5 by Anonymous from Excellent jewellery. I am very pleased with the earrings I purchased. The earrings are fab and so was the presentation.